Happy IPA Day! IPA Day started back in 2011 as a way to feature in social media what has quickly become the country’s most popular style of craft beer, the India Pale Ale. IPAs are nothing new, of course, but consumers’ thirst for these hoppy elixirs continues to grow exponentially year-after-year. What started as a social media experiment has now spread to include IPA Day events and celebrations at breweries and bars across the country. All you need to do to participate, though, is crack open an IPA and if you feel like spread your love of IPAs on Twitter/Facebook, etc… with the hashtag of #IPAday. Some people (you know who you are) are too cool for school when it comes to IPA Day…..whatever. I like IPAs, and bringing attention to the craft beer industry on major news websites around the country is a good thing if you ask me (no one ever does). I won’t geek out on Twitter for IPA Day, but I’ll surely find a way to celebrate my own way this evening. Out here in the Pacific Northwest, our love of IPAs is now ingrained in many of our DNA, myself included. While I enjoy all styles of beer and do more than my share of trying as many different beers as possible, when it comes down to just grabbing something to have a few of a pint of an IPA often ends up in my hand. But, there are many different types of “IPAs”: American IPAs, English IPAs, imperial IPAs, black/brown IPAs, Belgian IPAs, session IPAs and more. All are not created equal, but all have their place. The first IPA I recall having was a Three Floyd’s Alpha King* back in 1998 (I definitely was not 21) at a Mexican restaurant called El Taco Real in Hammond, IN, where 3F was originally located prior to moving to their current spot in Munster, IN (my hometown). I still remember saying to the friends that were with me something along the lines of, “Why does this beer taste like grapefruit? That’s just weird…but I kind of like it.” And, so began a long, continuing love affair with IPAs. When I really started getting into craft beer and trying as many different beers as I could, I was drawn towards big beers with bold flavors. In IPA territory, that meant I really enjoyed trying imperial IPAs; for a while, at least. These high ABV, often unbalanced and sweet IPAs offer a lot in the flavor department, but they aren’t typically very sessionable (there are many exceptions, though). After a while, I really got burnt out on imperials and they took a back seat to more balanced and sessionable IPAs. That’s really where I’m still at today. What I look for in an IPA is something that has bright hop flavors, but the bitterness and malt are balanced. I also really appreciate the new flood of “session IPAs” that continue to evolve in the market. 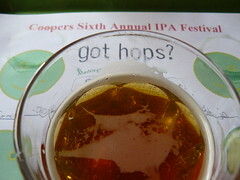 It is a tough style to get right, but when done well I’m happy as can be with a hop-forward beer with an ABV under 5%. I’m also a big fan of all the offshoot styles of IPAs. I have several friends who hold black IPAs in high disdain, but I’m a sucker for the combination of roast and citrus flavors. I also think that Belgian IPAs can be outstanding, especially when the ABV is kept at a reasonable level and the sweetness is in check. Our love for IPAs continues to evolve, and with it come some growing pains in the industry. There is only so much of each hop variety to go around, and a brewer can’t always find the hops he wants to craft the perfect IPA he’s come up with in his/her head. I’ve spoken to a few brewers this summer who just don’t have the access to the hops they want, especially for newer breweries without hop contracts. But, even established larger craft breweries can have issues with getting enough of a certain hop. I wonder how many brewers out there wish that the whole IPA craze would just slow down a bit? Trying to meet the seemingly insatiable demand for hoppy beers can really limit the experimental nature of a brewer to try out other styles. When all that customers and bars want to buy from breweries is an IPA, the incentive to make something else is quite reduced. Whatever happens in the future, IPAs are here to stay. I’m still waiting for the first “IPA-only” brewery to open up…I’m sure someone has at least thought about it. * Three Floyd’s calls Alpha King an American Pale Ale. At “6.66%” ABV and 66 IBUs I call it an IPA. Either way, it’s a fantastic beer. Happy IPA Day to yourself! I’m going to kick back and enjoy a “tester” of the IPA I brewed for my wedding coming up!